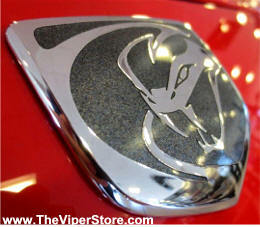 Factory original hood emblem for the 2013 to current Dodge Viper. Chrome with crinkled charcoal blue-gray background. Same emblem for all body colors. 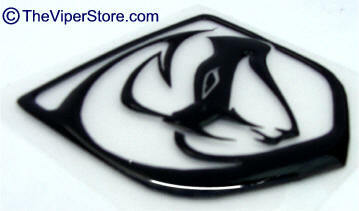 "Stryker" Emblem - 3-D stock emblem vinyl mounts anywhere inside or outside. Easy peel and stick. Indoor or outdoor on your Viper! "SRT" Emblem - stock emblem mounts on the fender. Chromed ABS plastic. "GTS" Emblem - stock emblem mounts on the fender. Chromed ABS plastic. Emblem set in ABS plastic. Includes chrome "VIPER" with a chrome "GT" under it. Easy peel and stick. 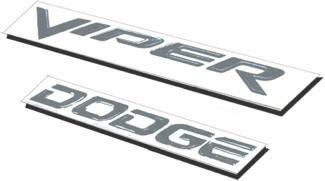 The word VIPER 7 3/4" inches long Factory original emblems by Dodge. 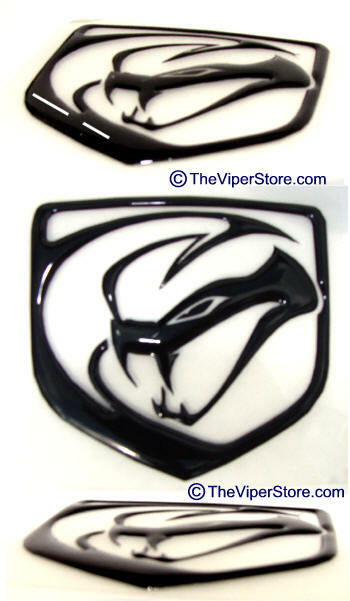 "Stryker" Emblem - 3-D stock emblem chrome ABS plastic. Mounts anywhere inside or outside. Easy peel and stick. There is no background the set of letters peels off and sticks on to your cars body. Raised three dimensional word "VIPER". Size 9" x 1 3/4"
What a difference this will make on your Viper! Will not fade, rust or lose their luster. Chrome vinyl base with a clear polyurethane raised 3 dimensional layer on top of each letter. Creates a in depth rich 3-D sparkle chrome finish. 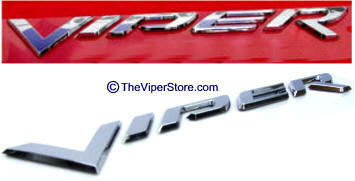 High Polished Stainless Steel emblem to put on your back bumper. These will never rust, corrode or ever lose their luster. Easy peel and stick mounting - will not come off until you take them off. 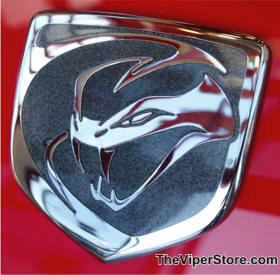 Includes one (1) "VIPER" emblem. Included are two factory emblems. You get a "DODGE" and a "VIPER" in Black. Easy self stick mounting. 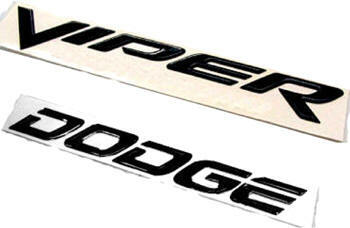 You get both of these bumper stock emblems (one for each side) "Viper" & "Dodge". Let them know how much power is coursing through your Viper! 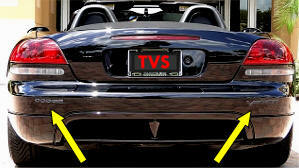 Chrome raised vinyl letters indicating Horse Power for your vehicle. Item is for one emblem - Chose 640HP or if you have performance mod's 700HP. Or Special Edition is available. Includes one emblem of your choice. Chrome letters have NO background. Approximately 4 inches long. Chrome raised Plastic letters indicating Horse Power for your vehicle. 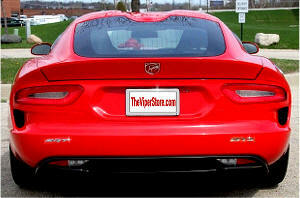 Item is for one emblem - Chose 640HP or700 HP if you have performance modifications like a full exhaust system. Chrome letters have NO background. Includes one emblem of your choice. 1 emblem Mount them Anywhere! Let them know your Viper! Chrome raised Plastic letters indicating Horse Power for your vehicle. Item is for one emblem - Includes one emblem of your choice.